Standing proud in the Museum's Human Evolution gallery are two of the most scientifically accurate reconstructions that exist of a Neanderthal and early modern human. Find out how these lifelike models were created by Dutch artists, the Kennis brothers. As visitors wander among the fossils, tools and other artefacts in the gallery, two standout characters put a human face to the last phase of our epic evolutionary journey. Staring into the twinkling eyes in the weathered features of the Neanderthal man, it's possible to feel a moment of connection, of recognising another fellow human (albeit of a different species). He is based on 40,000-year-old Homo neanderthalensis remains found at Spy in Belgium. The other gentleman in the gallery is a model of an early modern human living around 30,000 years ago, referred to by some scientists as a Cro-Magnon, who was part of the Gravettian prehistoric culture of Europe. He is reconstructed from a male Homo sapiens skeleton from Paviland in Wales (the famous 'Red Lady' who wasn't a lady) and, since that is a partial skeleton lacking a skull, a roughly contemporaneous skull from Předmostí in the Czech Republic. Identical twins Adrie and Alfons Kennis, who are among the world's leading prehistoric model makers, worked for six months to create the two ancient human replicas, with help from Museum scientists. The specially commissioned models blend scientific and aesthetic interpretation. Prof Chris Stringer, human evolution expert at the Museum, was happy to inform the creation of the reconstruction. 'The models are based on the very best scientific evidence we could put together. The models help to highlight key differences between Neanderthals and an early example of our own species. Both are naked to show their physiques. Early modern humans were taller and less stocky than Neanderthals, perhaps more suited to endurance running than short bursts of speed. The Homo sapiens man's body proportions were similar to those of men who live in hot conditions today. In comparison, the Neanderthal's body was suited to cold environments. But despite this, in the cold climate of the last glaciation, he would have worn animal skins to survive. When looking at the modern human, people sometimes think he has a cigarette in his mouth, but tobacco and smoking are a far more recent concept, as far as we know. The item is actually a twig paintbrush. The man is posed as if in the middle of decorating his body. His upper legs show bold black designs and his fingers are stained with the manganese dioxide pigment he used to create them. The markings are genuine designs by early modern humans - they were copied from engravings found on mammoth bone at Předmostí. His lower legs are stained red with ochre. The remains this model is based on were found, in 1823, smeared with this naturally occurring iron oxide pigment and buried with periwinkle shells and fragments of ivory rods and rings. The Neanderthal is also shown with body decoration, as evidence suggests this artistic behaviour was not unique to modern humans. In fact, body painting may have been the earliest form of art - ochre was being used at least 200,000 years ago in Africa and Europe. Evidence indicates Neanderthals were using pigment to decorate or camouflage their bodies as long as 60,000 years ago at least. Blocks of manganese dioxide showing clear signs of usage - including some shaped into crayons - have been found in at least 70 Neanderthal sites. They used charcoal in a similar way and apparently preferred black to red or yellow. The Kennis brothers were keen to pose the humans naturally, in a way you might meet them. So what goes into making such models? 'What we do is palaeoart,' explains Alfons. 'We make reconstructions of extinct mammals and especially early humans. These techniques include layering clay over a cast of a skull, fleshing out the face using a chart that details known tissue thicknesses at particular points. The brothers also need to build the replica skeleton, straightening out any distorted bones and then layering on the artificial muscles. This is used to make a mould in which to create the models out of silicon. Creating believable characters and giving faces emotion both require artistic skill. Try putting your hand on your face. Can you feel where your bone is very near to the skin? According to Alfons it's easy to know what people would look like around the part of the face where the flesh is thin, when you know the skull shape. An example would be the bridge of the nose or the forehead area (called the frontal bone). The finished models arrived at the Museum in early 2014 and were displayed in a temporary exhibition about humans in Britain. They were then incorporated into the Museum's Human Evolution gallery, which opened in December 2015. Recently the Kennis brothers reconstructed the face of another modern human, Cheddar Man - the oldest nearly complete Homo sapiens skeleton found in Britain. This pioneering reconstruction was based on DNA data generated by a team of scientists from the Museum and University College London using cutting-edge sequencing technology. As well as providing genetic evidence of Cheddar Man's skin tone, eye colour and hair type, the Museum provided 3D scans of his skull. These were prepared using high-tech equipment originally designed for use on the International Space Station. 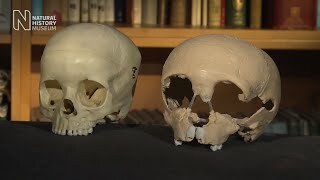 The scans enabled the brothers to 3D print Cheddar Man's skull, providing an accurate base for fleshing out his facial features and incorporating the results from his genetic profile.